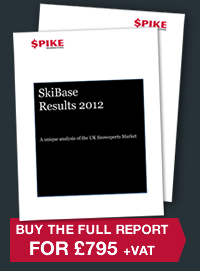 This report looks primarily at the ski and snowboard holiday market. It also includes information on equipment and dry ski slopes, but its focus is on understanding the ski holiday market in the UK. The analysis is drawn from some 15,000 responses to a rigorous online questionnaire that was sent out to the email bases of a variety of ski tour operators, travel agents, tourist boards and travel providers. All responses were collected between October 2011 and March 2012. It is – as far as we are aware – the largest consumer survey ever undertaken into the UK snowsports market. 5.1.1 Skier geography - mapping where skiers live. 5.1.2 Gender split and the disappearing females. 5.1.3 The aging skier and the population pyramid. 5.2.2 Ski rejecters – why don’t people ski? 5.2.3 Who skis, who snowboards? Life begins at 30. 5.2.4 The experienced skier is driving the market. 5.2.5 Frequency and occasion - who skis twice or more each season? 5.2.7 If not last season, why not? 5.2.8 Party composition. Families, friends and couples. 5.2.9 Usage of dry and indoor slopes. The link with ski holidays. 5.3.1 Who buys ski equipment? 5.3.2 What equipment do they own? 5.3.3 How often do they replace equipment? 5.3.4 What motivates people to buy their own ski equipment? 5.4.1 Who intended to ski in 2011/2012? 5.4.2 If not this season, when next? 5.4.5 Spend bands and finding the big spenders? 5.4.6 Latent demand. The ski market over the next 5 years. 5.5.1 Who books? Defining the decision maker. 5.5.2 The time between booking and departure. Capturing the early booker. 5.5.3 When skiers book for. Focus on the off-peak skier. 5.5.4 The decision process – sources of information and their importance. 5.5.5 Ideal duration – are short breaks the answer? 5.7.1 Country retention rates. The winners and losers. 5.7.2 Resort overview. The top 5 resorts skiers recommend. 5.7.3 What do skiers rate about the best resorts? 5.7.4 Resort table. 50 resorts rated by skiers. 5.8.1 The power of recommendation. Exploiting advocacy. 5.8.2 Has skiing become too expensive? 5.8.3 ‘Dealification’ – the growth of the deals culture. 5.8.4 Is all inclusive pricing the answer? 5.8.6 The growth of the last minute booker. 5.8.7 The use of TripAdvisor in the ski market. 5.8.8 The summer trade off. Are ski holidays a luxury? 5.8.9 It’s not just about skiing. The experience is what matters. 5.8.10 If the snow’s not looking good, I won’t bother booking.